I see it all the time. A look of concern on a mom’s face while their child is having their teeth cleaned. “Are there cavities?” they wonder. “Will they need braces?” Wouldn’t it be nice if you could relax in our comfortable waiting room knowing that your kid is going to have a brilliant dental check up? Here’s some things you can do to give your kids a really good shot at dental health! Be a great example: Your kids see and hear everything that you do. And they somehow always repeat what you’ve said at incredibly bad times (think “daddy doesn’t like Grandma’s cooking” at Thanksgiving dinner). So they see how you take care of your teeth, too. They notice if you brush and floss often, or not. They’ll see you chew sugarless gum after meals and will probably want some, too! Get your teeth fixed: tooth decay and gum disease are a bacterial infections. They are transmitted in a similar fashion to a cold. The bugs that cause tooth decay are almost always transmitted from mother to child, although anyone who is a prominent care provider (dads, grandparents) can also transmit them. What I’m saying is that your kids will have your bugs. What determines what kind of bugs you have? People who have lots of cavities, particularly lots of untreated cavities will have nastier bugs. So, if you’ve got a history of lots of cavities or you have work that you need to have done, you probably have nastier cavity bugs. And you’ll probably transmit them to your kids. The moral of the story…have your teeth fixed and your kids will have healthier teeth. Bring ’em in early, and often: The American Academy of Pediatric Dentistry (AAPD) recommends “first visit by first birthday.” Practically speaking, you should bring them in once they have their first tooth. And they should be checked every year after that until they start having their teeth cleaned, which is usually around the age of 4. Having a dentist look at your child’s teeth often can help find problems while they’re small. Since baby teeth are actually more susceptible to cavities than adult teeth, this is pretty important. 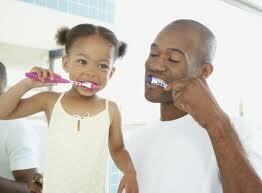 You brush their teeth, then let them brush their teeth: It’s great to raise independent children. It’s great that they want to take care of themselves. But you need to brush their teeth. An adult should brush first, then the kiddo brushes second. Parents, you’ll need to brush with a firm hold on your little cherub’s head. And you need to retract (pull apart) their lips with the hand that you’re holding their head with so that you can see the surfaces of their teeth. As one pediatric dentist once told me, “if you can’t see what you’re brushing, you’re not brushing it well.” Once you’ve scrubbed all the surfaces, then let the child have a chance to do the same thing. How long until they’re old enough to brush on their own? Well, my oldest is 4 years old and I’m thinking it’s going to be 6 more years of me using the “loving headlock” on him. 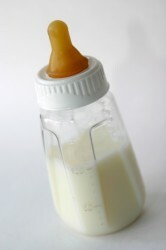 Don’t put a baby down with a bottle: Don’t get in the habit of putting your baby down with a bottle. Once they get used to it, it’s much more difficult to break the habit, so don’t do it! Even if you’re giving them formula or breast milk, there are still sugars in them that can be turned into acid by cavity bugs. Pediatric dentists often times call the massive tooth decay found in very young children “baby bottle tooth decay” for a reason. If you have to put a baby to bed with a bottle, use only water! Reduce the juice: When you think of fruit juice you think of “wholesome” and “healthy.” When I think of fruit juice I think “tons of sugar” and “high acid content.” Kids should have limited fruit juice intake. It’s really tough on teeth and almost always has a lot of added sugar. I know it goes against how fruit juice is marketed, but it’s true. Eating fruit = great! Drinking fruit juice = really bad for teeth. If you want to give your kids juice, do it at meal times…not snack time! If you do these things the risk factors for cavities and other dental problems can be reduced significantly! So when you’re waiting for your baby to have their cleaning finished you can sit back, relax and know you’ve done your job. Ahhhh! Doesn’t that feel better? Did you find this post helpful? Informative? Bone headed? I’d love to hear about it! You can share any Mead Family Dental post with a “Like” on Facebook, a “+1″ on Google+ or you can even “Tweet” it with Twitter! All you need to do is hover over the heart shaped button next to the title of the post. Or you can leave a comment by clicking on the balloon shaped icon next to the title.